They’re an American concept that embraces fun, junk food, cuteness, and factory-made components. Think: boxed cake mix, crumbed together with packaged frosting, dipped in artificially-colored, microwave-melted candy buttons! But not these! These are a grain-free, refined-sugar-free version good enough to serve to all your kid's friends at a fall birthday party! 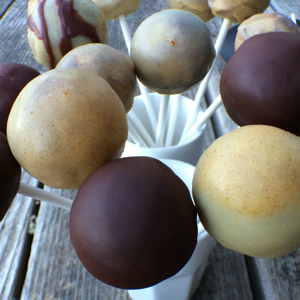 Makes approximately 50 1-1/4 inch cake pops. Glaze and shell recipes easily doubled. Preheat oven to 350 degrees Fahrenheit (or preheat your cake pops waffle iron). Place the following cake ingredients into a large mixing bowl: eggs, coconut butter, fat of choice, pumpkin, maple syrup and spices. In a separate small bowl, sift together coconut flour, baking soda and sea salt. Add dry ingredients to the wet ingredients and fold in until thoroughly incorporated without over-mixing. Pour batter into bottom half of cake pops (silicone) pan. Follow manufacturer’s instructions for putting on the pan lid. Bake about 13 minutes and then check for doneness, inserting a toothpick into the center of 1 pop. They are done when there is no wet batter adhering. Make the glaze while the cake pops cool. Combine glaze ingredients in a blender. Pour glaze into a small bowl, preferably one that tapers at the bottom, not a flat bottom one. If needed, place this bowl in a larger bowl of hot water to keep the glaze runny. To make the chocolate shell, simply whisk together the 3 ingredients in a small bowl. Double or triple this recipe, based on how many chocolate-dipped pops you want. When the cake pops are mostly cool, insert a popsicle stick (or these wooden popsicle sticks) 3/4 of the way into each one of them. Place them in mugs or low cups and freeze for 15 minutes. Dip each pop into glaze, tapping the stick against the cup's rim to remove any excess. Swirl the pop around as the glaze dries, to evenly distribute. Place each pop, as it’s completed, into the cup again. You will double dip each pop; so don’t worry if the glaze looks thin. Working in batches, place pops back into freezer after several have been dipped the first time. Once they refreeze for 5 to 10 minutes, double dip them, repeating the former method. To decorate with cinnamon or cacao powder, dip the dried, iced pops into a little dish of one of the powders, rolling it around to cover and tapping off any extra. This final garnish gives them a more sophisticated, adult flavor. I recommend this treatment for grown-ups and the glaze or chocolate shell alone for kids. You can also use the chocolate shell to drizzle chocolate stripes across either icing. Use attractive twigs (thin but strong) to create a frugal, autumnal alternative to buying popsicle sticks! Add 1 to 2 tablespoons cacao or cocoa powder to the icing recipe, for a chocolate version of the Pumpkin Maple Spice Glaze. Whisk it in completely and dip pops according to above instructions. You'll only need to dip each pop once with this method. See this recipe for more information on cocoa butter's nutritional profile and how to use it in cooking.